In 1890, Dr. Lucius B. Morse, a physician from Missouri who had been diagnosed with tuberculosis, traveled to the thermal belt of WNC to seek a more healthful climate. He fell in love with the beauty of the mountains and often rode horseback to Chimney Rock to view the giant monolith towering over the Hickory Nut Gorge. In 1902, Lucius and his brothers purchased 64 acres of Chimney Rock Mountain, including the 315-feet monolith known as Chimney Rock, from Jerome Freeman for just $5,000. The Morse brothers expanded the Park to nearly 1000 acres and were responsible for adding the trail systems and many modern improvements, including the elevator, which was opened to the public in 1949. The Morse family owned the Park for over 100 years and in 2007 decided to sell it to the state of NC so that its beauty would be protected and could be shared with visitors from around the world for generations to come. 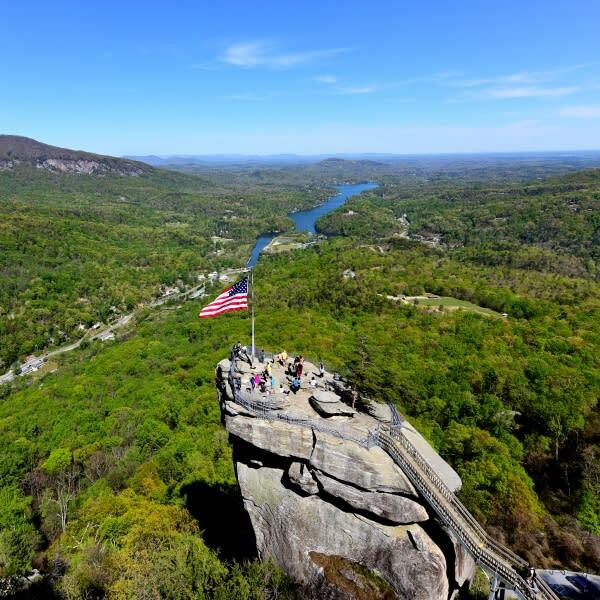 On the morning of July 4th, State Parks will celebrate both its centennial and the 100th anniversary of the first time the American flag was raised atop Chimney Rock. Both the US flag and the NC State flag will be raised, and the NC State flag will be taken down and placed in the parks historical archives and saved for future generations. Join us for this momentous occasion, then plan to stay and discover news ways to see Chimney Rock differently!